Always enabled. Can be turned off in control panel. Game runs too fast above 60 FPS. Limit the frame rate if needed. Open <path-to-game>\Bin\d3d9.ini or %USERPROFILE%\Documents\My Mods\SpecialK\Profiles\Game.exe\SpecialK.ini depending on the installation method you used. Change Borderless=false to Borderless=true under [Window.System]. Start the game with fullscreen mode enabled. 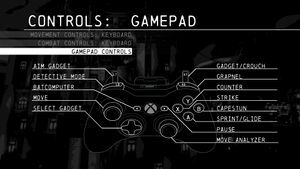 Controls menu can be accessed from pause menu. 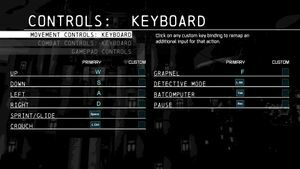 Rebinding isn't possible but it's possible to have extra custom keybinding per action. 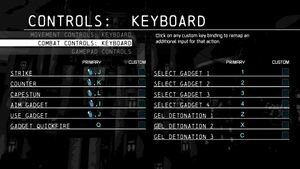 Keys that are used by default or mouse buttons can't be used. Change DisableRumble=false to DisableRumble=true under [Input.XInput]. ↑ 2.0 2.1 File/folder structure within this directory reflects the path(s) listed for Windows and/or Steam game data (use Wine regedit to access Windows registry paths). Games with Steam Cloud support may store data in ~/.steam/steam/userdata/<user-id>/267490/ in addition to or instead of this directory. The app ID (267490) may differ in some cases. Treat backslashes as forward slashes. See the glossary page for details. This page was last edited on 8 April 2019, at 10:58.